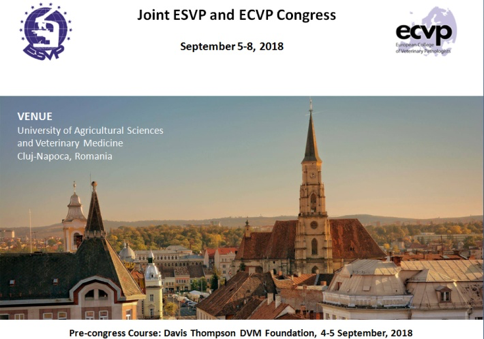 This joint ESVP/ECVP and ESTP meeting covers traditional, emerging and innovative aspects of pathology including diagnostic and molecular pathology; a range of species such as rodents, domestic, wildlife and zoo animals; and toxicological pathology as well as spontaneously occurring and experimentally-induced diseases. The main purpose of such a meeting is to re-fresh and advance your skills in the wide-ranging field of pathology and to initiate and develop your professional network . This year’s congress provided an outstanding collection of State-of-the-Art key note lectures, interactive workshops, symposia, poster presentations, poster flash and oral presentations fostering soft skills in data presentation and discussion in a scientific manner. Further topics included educational sessions, scientific writing lectures and training of trainers to ensure a holistic in-service and advanced training. Meetings like this are one of the few opportunities to become exposed to the great diversity within the field of veterinary pathology. Besides fostering scientific and professional skills these meetings represent an exceptional opportunity to improve and amplify your personal network. In the present rapidly changing world which is experiencing revolutionary development of new techniques and points of interest, collaboration among scientists is becoming more and more essential. The latter can be most easily accomplished when you have built up a profound network over many years. I know that for young pathologists it is sometimes very difficult to find the right direction for your own professional development. The numerous options, ranging from diagnostician, study designer and analyser, management, and bureaucratic challenges in regulatory affairs can be highly confusing and final commitments can be very difficult. In other words, the variety of the possibilities even within the occupational area of veterinary pathology, which is a blessing in my mind, may be considered as a boon and bane for the beginner. Actually it is the same situation as you experienced when you started as a veterinary students. As freshman veterinary students most of us wanted to become a practicing veterinarian, treating and/or saving animals including elephants around the world. However, during our time as students or after finishing the veterinary curriculum we realised that even within the well-established field of veterinary medicine numerous options arise and challenging questions concerning diagnostics, understanding disease mechanisms and pathogenic processes require further ongoing research. Moreover, various non-practicing fields of activity appeared highly appealing. It seemed that after deciding to become a pathologist everything is straight-forward; what a surprise, when we learned that even within this discipline a plethora of options exist including diagnostic pathology, designing and analysing complex studies with various morphological and molecular data sets and/or making a career in private diagnostic laboratories, academia and industry, just to a name a few. In addition, the pathologist´s tool box has been expanded substantially and continuously in recent years and besides traditional classic morphological techniques (e.g. histology, immunohistochemistry and in situ hybridisation), also includes molecular analysis (e.g. whole transcriptome shotgun sequencing, next-generation sequencing) and interpretation of PCR, microarray analyses and RNA sequencing data together with morphological findings. In this respect these meetings provide a great platform to refresh your knowledge in neglected fields, to keep up with emerging concepts and expand your professional expertise. Nowadays it is not possible to have an in-depth knowledge in all sub-specialties within the field of veterinary pathology. Therefore, it is important to have a strong network to obtain complementary support to ensure good and solid analysis and science. In order to accomplish these goals such a meeting is the best place to start. With this in mind, enjoy the congress and make it to your own success story. The next ESVP / ECVP Summer School will be kindly hosted by the Veterinary Faculty, Universidad CEU Cardenal Herrera, Valencia, Spain. The dates are now confirmed as from July 15th to 25th. This year, in addition to the mock exam, the topics will be: GI tract, urinary tract, GEMS, Reptile and Fish/Marine mammal pathology. For those who may wish to refresh their knowledge in specific areas, attendance at individual topics is open to all pathologists. The ESVP and ECVP are able to offer some stipends covering the registration fees to participants whose financial circumstances make it difficult to attend the event without further financial support. Further details of the programme and how to apply for stipends will be advertised and registration will be opened in a few weeks. This successful event exemplifies the great and continuous collaboration between our two organisations. The Scientific committee (SC) is a joint delegate commission of the ESVP and the ECVP. It is responsible for the organisation of the scientific programme of the Annual ESVP/ECVP Congress and reports to both the ESVP Board and the ECVP Council. Composition of the SC changes every year after the SC annual meeting. ESVP Board members, Lyon, 2017. Top row from left: Sanja Aleksić-Kovačević, Gail Leeming, Achim Gruber, Carl Hard af Segerstad, Bottom row from left: Enrico Bollo, Polona Juntes, Jerome Abadie, Wolfgang Baumgärtner. Election of 22 new ESVP members in Lyon 2017, Welcome! 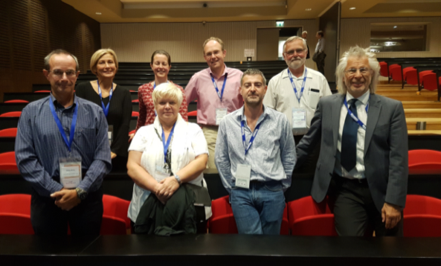 The Davis Thompson DVM Foundation presented Prof. Maja Suter, formerly of the University of Berne, with the esteemed Olafson Medal at the welcome reception of the combined ESTP, ESVP and ECVP conference on the 30 August in Lyon, France. The international Olafson Medal was established to honour the memory of Cornell University Emeritus Professor, Peter Olafson (1895-1985) for his dedication to service, teaching and research in diagnostic veterinary pathology. A committee consisting of Cornell veterinary faculty members, past and present, and the CEO of the Davis-Thompson Foundation has been established to recognise veterinary pathologists who have best followed the three major endeavours of the Olafson tradition: service, teaching and research in veterinary pathology. This medal has only been awarded 13 times since 1980 to eminent veterinary pathologists including Dr Thomas Carlyle Jones of Harvard University, Dr Kenneth V.F. Jubb of the University of Melbourne, Dr John King of Cornell University and to Dr Roderick Else of Edinburgh University. It is highly fitting that Maja Suter is the first female recipient of the Olafson Medal. 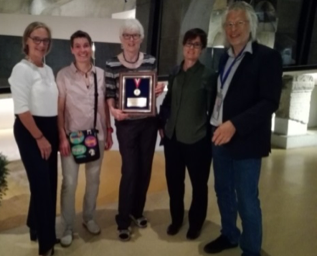 From left: Anja Kipar (ECVP), Sybille Groters (ESTP), Maja Suter with Olafson Medal, Liz McInnes (President of European Division of Davis Thompson Foundation), Wolfgang Baumgartner (ESVP). Prof. Suter qualified as a veterinary surgeon in 1974 and gained the Dr Med Vet in 1977. She was awarded the Diplomate of the American College of Veterinary Pathologists in 1987 and gained a PhD from Cornell University, Ithaca, New York, in the United States in 1988. From 1993 to 2014, Maja Suter held the position of Professor and Director at the Institut für Tierpathologie, Vetsuisse Faculty, at the University of Bern. 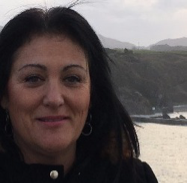 Over the years, Maja Suter has held the positions of Charter member, Council member, member of the Exam Committee, Vice President and President of the European College of Veterinary Pathologists. Prof. Suter has been involved in numerous research projects founded by the Swiss National Science Foundation, Morris Animal Foundation and Cancer League from 1993 to 2011. Maja Suter has published extensively on dermatopathology, in particular pemphigus vulgaris and has been invited to write many reviews. 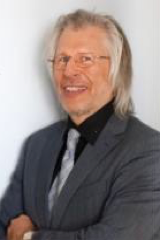 Prof. Suter was a co-founder and board member of the biotechnology company CELLnTEC Advanced Cell Systems. Maja Suter has been involved in curriculum reform activities at Cornell University in the United States and at the University of Berne. In addition, Maja has been pivotal in the organisation and teaching of the veterinary pathology residency programme at the veterinary faculty of the University of Berne. The audience of approximately 300 delegates at the welcome reception cheered and applauded as Prof. Suter received the award from Dr Liz McInnes, President of the European Division of the Davis-Thompson DVM Foundation. Prof. Suter gave a short but gracious acceptance speech indicating her pride and happiness at winning this award and emphasising how she could not have achieved her success without the support of her veterinary pathology colleagues. Are you a student member or a regular member of the ECVP/ESVP? Then get ready to take advantage of these great opportunities at next year’s annual meeting in the heart of Transylvania! Did you know that the quality and speed of the internet in Romania is among the best in the world? Relax and get ready to be surprised by the ECVP/ESVP 2018 meeting in Cluj-Napoca, Romania! We are what our genes are! And, although it is not so simple, there is still much of truth in this statement. All physiological processes run at the level of molecules, where we meet an enormous entanglement of interlocking metabolic pathways involving nucleic acids, structural and functional proteins (including enzymes), regulatory proteins, other macromolecules or simple substances. All these mechanisms started to be revealed thanks to the constant development of methods looking down into the molecular level. And what is pathology? It is merely the diversion of the, more or less well defined, physiological processes from the normal pathway. It means that the molecular insight into the nature of life is equally important for pathologists. It is thanks to the enormous development of molecular biology that we were able to get molecular insight into the pathobiology of diseases important for humans and animals. Now, hot topics in molecular pathology are studies of oncogenesis and the search for anticancer therapy, neurodegenerative disorders, HIV infection and treatment, cardiovascular disorders and gastrointestinal inflammation associated with Crohn’s disease and ulcerative colitis, as well as genetic polymorphisms in relation to different pathologies. Of course, other pathological conditions are also studied at the molecular level. In animals, molecular pathology is intimately associated with experimental pathology using laboratory (and other) animals as models of human diseases. This is closely associated with the search for the best models of human diseases, allowing for the control of development of disease and its study at the molecular level, under controlled conditions. Lack of suitable animal models often hampers the research and leads to frustration among scientists. Many discoveries and treatment methods are “leaking” from human to veterinary medicine when they are becoming more popular and less costly, making the flow of benefits to animals “the way around”. However, veterinary medicine also benefits directly from molecular pathology research in many fields such as virology and immunology of infectious diseases. This is partly due to the development of molecular methods, their widening availability and slow reduction of costs of the equipment and reagents, which makes their use widespread in veterinary research. The “triumphal” march of molecular biology in veterinary research is clearly visible during last 20-30 years. In the 1980’s, molecular biology laboratories were located only in specific departments at veterinary research institutions and they were usually not within departments of pathology which were mostly using histopathological methods for their research. Nowadays, the molecular biology equipment and skills necessary for their scientific application is really widespread. 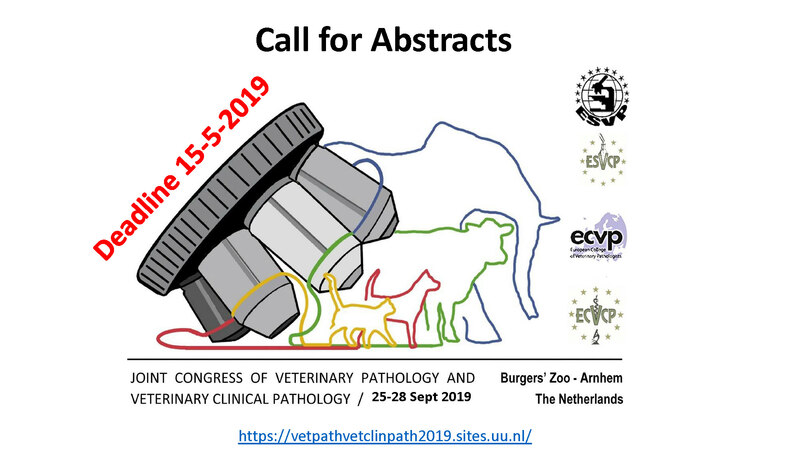 Abstracts from recent ESVP Congresses could serve as a source of data to evaluate the extent of application of molecular studies in veterinary pathology. But, it is a difficult task since a short and concise abstract often lacks information to classify the described study to this category. On the other hand, it is quite an arbitrary decision whether to include an abstract in the “molecular” category, since defining molecular biology is not easy and definitions are often fuzzy. In my opinion, molecular pathology involves a deeper, interdisciplinary insight into the mechanisms and needs use of more sophisticated methods. Traditionally, molecular biology involves nucleomics (studies of nucleic acids – DNA and RNA), proteomics (studies of proteins and their interactions using different methods) and transcriptomics (studies at the level of gene expression and its regulation). But this short list does not exhaust all the possibilities. I think that if routine histopathology, enhanced with immunohistochemistry, is used, it is not enough to claim it as molecular pathology research. But, anyone is free to disagree with me. I would like to state very clearly that this approach is not to divide presented studies into the better ones and those of inferior quality. Excellent studies and clever experiments are done in veterinary pathology using methods not belonging to the molecular biology, and excellent lectures were given during meetings which were completely out of the molecular pathology field. However, showing some data would be interesting. In Berlin (2014) 33% of keynote lectures, 26% of oral presentations and 21% of posters were linked to molecular pathology. Percentages within the same categories in Helsinki (2015) were 42%, 29% and 22%, respectively. In Bologna (2016) they were 33%, 41% and 21%. In Lyon, 4 out of 5 (80%) keynote lectures were associated with molecular pathology, as well as 36% of oral presentations. Surprisingly, according to my assessment, only 16% of posters were dealing with this field (contrary to my impression as a visitor to the poster session). This is due to the fact that posters present a huge variety of topics, involving case studies, statistical analyses of cases, etc. In this diversity, studies related to molecular pathology were not visible very prominently. However, the presented (surely very imperfect) analysis shows clearly that molecular research is a well-established field of veterinary pathology and its significance increases with time. The abundance and diversity of research methods is crucial for any research field, including veterinary pathology. We have to promote the knowledge and skills in molecular pathology to keep our research at as high a level as possible. Full Professor of Pathology at Faculty of Veterinary Medicine, University of Belgrade. Head of Pathology Department – Leader of two national projects, participant in several national and international projects . Published 1 book, 2 monographs, several scientific articles. 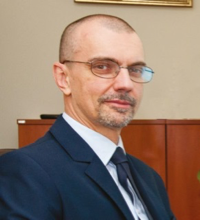 Editor-in-Chief of international scientific journal Acta Veterinaria, Beograd; Associate Editor of Veterinarski Glasnik (National Scientific Journal). Over 3 years of international experience at scientific institutions (Pathology Department, University Minas Gerais, Brazil; Institute for Pathology, JLU Giessen, Germany; Institute for Pathology, University of Leipzig, Germany; Neuropathology Department University of Bern, Switzerland). Board Member/Councillor of ESVP-European Society of Veterinary Pathology, and Davis-Thompson Foundation for Veterinary pathologists, USA. Councillor of Group for Medical Science at University of Belgrade. Graduated from Faculty of Veterinary Medicine in Olsztyn, Poland in 1990. Specialist in laboratory animal veterinary medicine. Professor of Veterinary Sciences and Head of the Department of Pathophysiology, Forensic Veterinary Medicine and Administration of the Faculty of Veterinary Medicine of the University of Warmia and Mazury in Olsztyn. Vice-Dean for Research Affairs of the Faculty. Associate Editor of the Polish Journal of Veterinary Sciences. Scientific interests - molecular pathology of the digestive and respiratory system - inflammation and oxidative stress. Dr. Gudan Kurilj was born in Croatia. She graduated in 2001 from the Faculty of Veterinary Medicine, University of Zagreb. From the beginning of her career she has been employed at the Department of Veterinary Pathology, Faculty of Veterinary Medicine Zagreb. She is involved in teaching in undergraduate and postgraduate studies, routine diagnostic procedures related to the pathology of domestic, wild and laboratory animals and her field of special interest is veterinary oncology. In 2015 she passed the ECVP certification exam and from 2016 she is a programme director of the ECVP residency training in Faculty of Veterinary Medicine Zagreb. Received PhD title in veterinary pathology in 2010 and the title of associate professor in 2014. He has many articles, two book chapters and many grant projects. He provides routine pathology services and supports research projects at his company. He also offers interactive use of digital imaging in both analysis and data setting with whole slide imaging techniques. DVM in 1988, from Faculty of Veterinary Medicine of the University of Lisboa. MSc in Immunology from ICBAS - University of Porto in 1993. PhD in Veterinary Sciences/pathology at UTAD-Portugal in 1998. Associate Professor with Habilitation in Histopathology/General Pathology at UTAD in 2006. Teaches General Pathology, Immunology and Teratology at UTAD. Director of the Histology and Anatomical Veterinary Pathology Laboratory of UTAD. Member of Society of Portuguese Animal Pathology (vice president from 2002 to 2006, and president from 2007 to 2011), European Society of Veterinary Pathology, Portuguese Society of Veterinary Sciences (and member of its government for 10 years), European Association for Cancer Research (EACR), Portuguese Association of Cancer Research (ASPIC) and Portuguese Society of Immunology. Scientific research in Veterinary Immunopathology and Oncology. Is the author of several books, book chapters and articles on veterinary pathology. 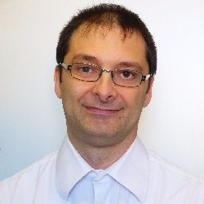 Coordinator and collaborator of several projects in veterinary nutrition and pathology. Invited reviewer of several journals in veterinary pathology.